See, this is why I number these things; so I can feel irrationally proud of myself for hitting arbitrary milestones. But yep, I have been at this for 50 volumes so far. Hopefully you have enjoyed most of them as much as I have enjoyed reading them. I do get a kick out of this series; I have reread some books I love, and I have read a lot of books for the first time (and have had various opinions on them). What more could a guy want? Jubilee! That’s how! I am nothing if not transparent. Do you sometimes worry I am running out of books starring/featuring Jubilation Lee to review? Well, I’m not, so don’t. Actually, funny thing… I just picked up this trade within the past half-year or so. I obviously had most of Generation X and the other books contained in this collection in my youth, but they were lost to time and circumstance since then. So when I saw the trades for volume 1 and 2 at my comic store this past summer, I snapped them up. Getting to relive this run again… good times. So this does, in fact, collect more than just the Generation X title; it actually leads in with four issues from the sorta-prelude Phalanx saga and the aftermath to that (all told, its Uncanny X-Men #316-318 and X-Men #36-37). The Phalanx Saga is one of the less well-remembered X-crossovers from the 90’s, sandwiched between X-Cutioner’s Song and Age of Apocalypse. It introduced the villainous Phalanx, a living techno-organic virus reminiscent of Warlock from New Mutants, which was out to assimilate all mutant life on Earth. In the process, several young mutants were introduced who would be recruited to the Xavier School for Gifted Youngsters after the conflict was resolved. This included the incredibly powerful Monet, the power-duplicating Synch, the elastic-skinned Skin, and Cannonball’s sister, Husk. Together with Jubilee and under the tutelage of Banshee and the White Queen, they would form Generation X. And they would even get a live action made-for-TV movie, too! Which I definitely watched when it aired, but remember less than nothing about. Was Max Headroom in it? I think he was. Why am I recalling that detail? Regardless, after the formation of the new Xavier School in Massachusetts, the team quickly recruits a few new members in the forms of Chamber and Penance… and they meet their arch-nemesis, Emplate. Emplate is a monstrous villain, visually frightening and nightmarish, as he is all sharp points and hunched and empty red eyes. He is tied in to Gen X members Penance and M, but that’s not an angle that would be resolved in this volume (or even the next one; 90’s X-books loved slow burn reveals. Mostly because the writers often set up mysteries without having a pay-off in mind). Let’s start with the art this week, as I really dig this gathering of artistic talent, especially Bachalo who was more or less the regular artist on Generation X. I’ve praised Bachalo previously for not just being a really stylized and fun artist, but also for being one who just “gets” drawing kids. He doesn’t turn the Generation X team into over-sexualized teen hotties, nor does he draw them as small children. They really come across as young men and women who are just coming into their own and have all the awkwardness of youth. His art may not be for everyone, and I can totally understand looking at his style and thinking it’s not what you were going for, but in the Jim Lee and Todd McFarlane inspired Marvel of the 1990’s, Bachalo had an indie form that was almost ahead of its time. What’s more, he is very fluid and can shift from dark and brooding pages covered in shadow to humorous antics and charming expressions to exaggerated action sequences all within a page of each other. Scott Lobdell as the writer here is really in his element, and his storytelling blends perfectly with Bachalo’s art. The Phalanx stuff itself is a bit overdramatic and self-important, but that’s typical of the X-Men in the 90’s. It’s the actual Generation X book (and the Uncanny X-Men #318 lead-in) where he excels, effortlessly blending heartfelt character drama with light-hearted humor. 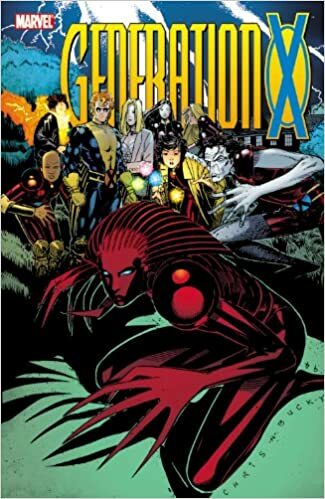 Most noteworthy in that regard is Generation X #4, a Christmas tale that sees Banshee and some of the students come across mutant who has taken a classroom hostage. The running narrative of the book is silly and fun, and there are Christmas elves “watching” the story from outside of the panels, but the tale concludes with the teacher who tried to be there for the boy dying of heart failure. Ultimately, the character is revealed to not even be a mutant; he just has physical abnormalities that cause others to view him as different. That issue makes me think of another point… I usually hate narration in comics. So often it is either explaining to me what I can already see going on in the art, to it is telling me info that I’d rather the book showed me. But Lobdell’s narratives in this title aren’t overdone, and when it is there, it’s to flesh out a scene or a character with a joke. It’s also fairly self-referential to make sure you are paying attention, and I dig that rather than the typical narrative boxes that usually add so little actual value. Talking Point: Scott Lobdell wrote the script for the movie Happy Deathday? Huh. I did not know that. So today’s topic: What are some of your favorite non-comic-related world of famous comic writers (or artists! maybe you are a fan of Rob Liefeld’s jeans commercials)? I genuinely adore this series, and it stays pretty good even after this introductory run. It was a more light-light-hearted rehash of New Mutants for a new era, but I never saw a problem with that. The art is spot-on for the story, and the writing is a joy.